The emergence of the Hardy Drop knife at auction recently caused plenty of discussion amongst some of my close collecting friends. Once the auction was over there was even more, mainly due to the fact that it sold for £3,200 certainly a record price for an angling knife. I was asked by various people why so much? The simple answer is that two people wanted it. I heard various reasons and various estimates as to how old it was and even read somewhere that it was circa 1910. Nothing beats a little research so here is the almost complete story of Hardy Drop Knife. 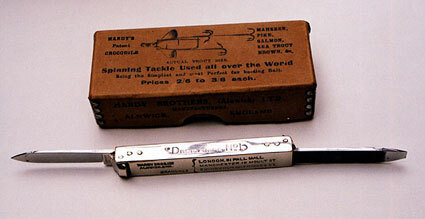 It was introduced in 1931 and was bought in by Hardy’s from the Sheffield knife maker J.R. Watts. It was offered in two versions the No 1 and the No 2. Now my resident Hardy Angling knife expert had never heard of this maker before. With at least five known makers producing knives for Hardy this now makes it six. J.R. Watts were established in 1765 and finally ceased trading in 1995. Their trademark was B4*ANY and they specialised in Cutlery, Pen & Pocket knives and safety razors. In 1890 he invented the safety razor beating Gillets by more than a decade. If only he had pursued its marketing we might not have seen the Drop Knife. The No. 1 knife had two implements, a blade and a screwdriver. One side of the screwdriver was slotted just over half way along its length so that it could be locked and used like a “stubby” screwdriver. The other side of the screwdriver was cut like a file. The No. 2 knife had just the blade. They sold for six shillings and sixpence and five shilling respectively. There was a hook gauge along one side of knife from size 1 to 000 and a scale adjacent to this in centimetres and inches. The body of the knife was made of brass that would have been stamped and then nickel silver plated. The knife was not featured in the next catalogue issued in 1937. So we knowthat Hardy’s only sold it for a maximum of 6 years and we can guess at what sort of production run was made. I spoke to a few people who have experience of Hardy‘s and we thought that it could have been 50 for the No. 1 and 25 for the No. 2. However a chat with my knife expert and what emerged from it has changed my ideas. Hardy’s were famed for their meanness, sometimes only ordering one or two knives at a time for the less popular models. I have only seen three of the No. 1 Drop Knife and none of the No. 2. Speaking to various other collectors and dealers and one thinks that he saw a No. 2 once and that was many years ago. Consequently I would revise down the number of these knives made, possibly even single figures for the No. 2. One thing to bear in mind is that these knives are now illegal in the UK being classed as an offensive weapon due to the nature of their action. Veiw of the four sides of the knife. This entry was posted in Hardy Drop Knife. Bookmark the permalink. ever heard of a hardy bros. cavalry knife? I own a Hardy No.2 Fishing Knife left to me by my Grandfather some years ago. Should I wish to sell the knife can you recomend an auctioneer in this field. I have a Hardy’s Drop Knife No.2 nice condition but no box where could I sell it? I have a Hardy Brothers carving knife and fork set with decorative handles in special silk-lined box. Where can I sell this? Hi there I think this is the Australian Jewellery maker not the British tackle maker. I am an auctioneer at alnwick auctions in alnwick near to the hardy museum.